Can Smartphones Be Slowing Us Down? You’ve seen it before – You’re running to get to a destination, maybe get to the next flight, walk the street to your next meeting. You run into that one person looking down at their smartphone, oblivious to the world and slowing everyone down. You would like to curse at them, but you know you do it yourself. Are smartphones slowing us down? I just read an interesting article on Dineability.com. A popular New York restaurant noticed the service to be slow. They decided to bring in a group to see why. This group reviewed the surveillance system and noticed a trend that not made the servers slower, but the customer. The group had the restaurant pull up tapes from 10 years prior to figure out the problem. What they found was that the customer was slowing the process down because the first thing they did was pull out a smartphone. Some would take up servers’ time because they couldn’t connect to the Wifi. Others just simply were tweeting, e-mailing, reading that funny Facebook post, or whatever with their device. It makes me wonder what other things slowed us down because of a smartphone. I am reminded of a breakup with an old girlfriend. This actually was pre-smartphone days. I have to admit – I was the one getting dumped and it hurt. But what was more interesting was when she left the house, she got in the car and opened up her phone to text. Do we slow down our lives with this mobile device? 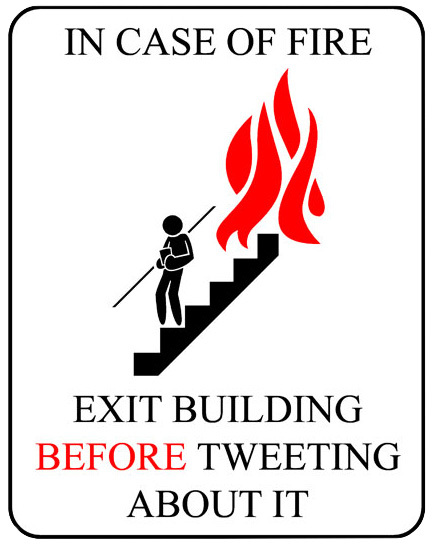 There is a popular meme out there: In Case of Fire – Please exit the building BEFORE tweeting about it. Was there a case where someone did tweet while trying to exit? Did they cause someone else to not get out of the building? There have been multiple studies on how smartphone use causes sleep depravation. This leads to major health issues, not to mention getting less sleep or even being late to work the next morning. As an IT manager in my previous life, I have faced these issues with online addictions. I remember sitting people down who just got Internet connections and trying to help them understand on how this hurts their performance. Even back in 2000, we had employees who took longer to finish projects because they were deprived of sleep and couldn’t focus because of their addiction. And we haven’t even touched the bathroom issue. Do you take more time taking care of business because you pulled out your phone to take care of business? I wonder how many games of Candy Crush, how many emails, Facebook posts read, or Tweets were made while sitting on the royal throne. It brings me back to the days where my Dad would spend a lot of time with paper in hand on the toilet. Even back then there were studies saying sitting on the pot too long could cause hemorrhoids, leg circulation problems, inflame any back issues, or more. Worst yet, if there is one bathroom in the house and someone else has to go, they have to wait longer to do it. Try this: put up a stopwatch in the bathroom and record your times. Half of them, bring the phone in with you, then the other half without. See what the stopwatch says from when you sit down to when you flush. In the long run, we sometimes do need to slow down. Unfortunately, this trend might not be the best way to achieve that goal. 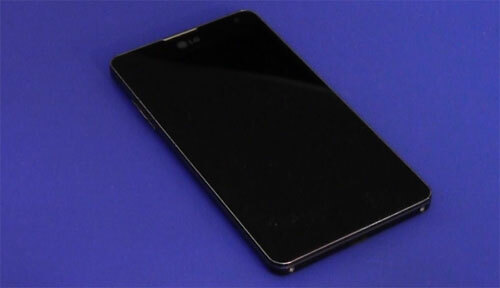 Smartphones are meant to be helpful, not hindering. So maybe keep the phone in the pocket until the food is ordered, the meeting is over, and the business is done.